I found this image on someone's Facebook page, how else? No, of course I wasn't stalking, I was merely browsing.....go on hands up, who is guilty? The problem would not exist if there were no creepy people in the world. We forget about the creeps and let down our guard and post things that would not put on a public sign. We forget how public FB is. Of course we forget many things such as how awful our head hurt after a night of drinking. People are always going to do dumb things but some are dumber than dumb. Ohh Bugger it! I typed a comment pressed to check it and the bloody thing has disappeared... Hope it went on to your thingy to be OK'd !!! Will check out later.. Love Kate x.
good point you're making here Lilly, may explain why I'm picky about who I add as Facebook friends! And that's exactly why I don't Facebook-- Or at least that's my excuse and I'm sticking to it. Had an issue with FB, last week, I signed off forever. 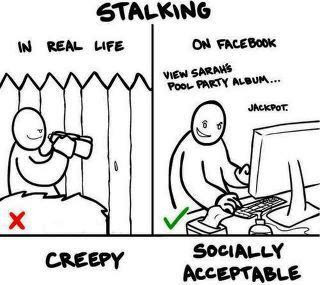 Of course I am a Facebook stalker....everyone is aren't they! It is one way to catch up with my extended family and friends. I often comment if I have time. Send me an email Lilly if you would like to be friends on FB. You joined fb??!! I thought you were the last one holding out. I would love to friend you if so. You can easily find me. Ha! That's me, don't ya know! Wow! I never thought of it that way, but it's true! Hope you are well, Lilly. Oh that would be all of us then. It really is a whole new world out there. Spooky! Funny... I think it was here long ago where I read you were considering joining fb.... obviously you did and this is funny. Finally got some time to myself. This means I have time to visit and comment on my favorite blogs sites. I think that when people post things on fb that they want family and friends to see them. I'd be sad if no one checks the picks that I'm sharing on fb. That's the whole thing about fb, isn't it? You put things out there to share? Invite me also if you'd like to befriend me there.